If you ever had to move specific files from one location to another you know how difficult of an operation this can be. Say someone connected an USB Flash Drive to your computer and you want to copy all images, video files or documents to it. While you could copy those files manually by iterating through all folders on the flash drive, you'd spend some time doing so. File Fisher is an easy to use program that automates part of the process for you. Note: The program requires a Java Runtime Environment (JRE) that needs to be available on the computer. If you don't have Java installed, Java Portable may be an option. When you run File Fisher it displays the following interface to you. You need to select the source directory, the root folder containing the files, and the destination folder first. Once done, you can either add file types manually, use extension groups listed in the interface, or select individual extensions from the right side of the interface. Extension groups add multiple extensions of the same file type to the file types list. If you select pictures for example, several picture formats including jpg and png are added automatically. You can mix as many file types as you like, and even reverse the field so that all files but the ones with the selected file extensions are copied during the process. File extensions that you find on the right can be added or removed. To do so select edit from the menu at the top and then either the add or remove extensions options. Another option that you find there is to add or remove file types to the six groups that the program supports. This allows you to add new file types to a group if they are missing, or remove them if they are not required. The program scans sub folders automatically by default. You can add more options including one to preserve the original file structure and how to handle file duplicates. The move/copy button next to start toggles the file operation. The last option provided is to create a zip file of the files that the program will pick up when it processes the source folder. A click on start runs the selected operation. 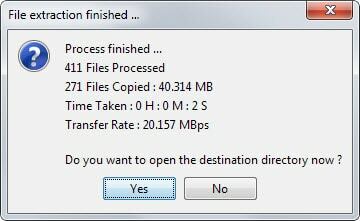 File Fisher displays a progress bar that highlights the progress in percentage. You get the option to open the destination directory once the operation completes. File Fisher can come in handy at times. Move all mp3 files out of a download directory, copy all video files from a USB drive to the video archive on a computer, or all documents from the My Documents location to a backup drive. That’s a good point, thanks! The strings in the Indian-made software look like what is typically written by a beginner in an English as a Second Language course. A feature unique to this software is showing the file transfer speed in bytes per second (bps) in the titlebar. Uh, I don’t get it. Why not just sort your files by type, select all the files of the type you want to copy, and then CTRL+C then paste to the folder/drive you want them copied to? Even that is not necessary. I can pick and choose file types with my back-up application. Don’t most back-up programs do that? I prefer DropIt (a Lupo PenSuite Project) I build my rules once and that’s it.